An epic love; the supernatural kind. It’s official, I am well and truly hooked. Not just your average kind of hooked though, the “hook, line and sinker” kind of hooked. As in even before the episode I am currently watching has ended, I’m already counting down the seconds until I can begin watching the next one. In fact, you could probably go as far as to say I am beyond hooked and although this isn’t a new found love of mine, considering I am now three seasons in and I’m already counting down the seconds until the fourth is aired, it’s a love that appears to be getting stronger and stronger by the day. I’m sure by now you’re probably thinking I’m just another one of those immature teenage girls who is obsessing over the current Vampire craze and to some extent you’re probably right, but when it comes to The Vampire Diaries, I’d say it’s a little more than that. Unlike Twilight, this is far from your average tale of a vampire and a girl. If you asked me, The Vampire Diaries isn’t just about vampires, it’s a story of epic love. Just what kind of epic love though, well that depends on which brother you choose. Stefan, well he is safe. He’s stable, he’s calm and he was there from the beginning. He’s the good boy, the one who would love you forever, unconditionally. He’s the boy who would stand by your side through it all, no questions asked. 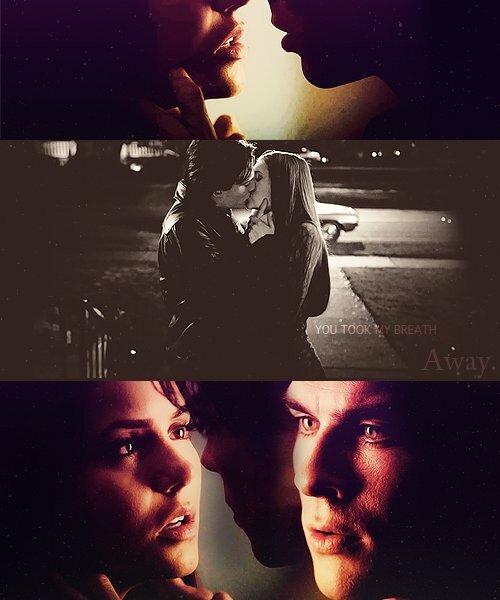 Damon’s love is dangerous. It’s overwhelming, it’s consuming and it’s the kind of passion that every girl dreams of. When Damon falls, he falls hard and when he loves, he loves with his whole heart. He’s the badboy, the boy that every girl wishes would change just for her, but with Damon comes a sense of mystery and where there is mystery, there is a sense of the unknown. So who do you choose? The boy who was there from the beginning, the one who stole your heart first; or the boy who has been fighting to win you over ever since. For me it’s simple; if I were Elena then I’d choose Damon. Damon would get the girl and the reasons are simple. Regardless of where it all started, any boy who loves a girl that deeply and that passionately and still finds a way to be selfless in his actions; then he deserves the girl. Any boy that is willing to put his heart on the line and fight that hard, for that long, with such a huge possibility of rejection; then he deserves the girl. Any boy who is strong enough to put aside his own emotions and stand by a girl while she falls for someone else, just hoping and praying for his one chance; then he deserves the girl. He deserves to win her heart, because let’s face it, what girl doesn’t want a boy to look at her the way that Damon looks at Elena. What girl doesn’t want to be loved that passionately. What girl doesn’t want that kind of romance, that kind of epic love? Just between you and me though, if we were talking outside of ‘Vampire Love’ then I’d choose the Stefan type, every single time.